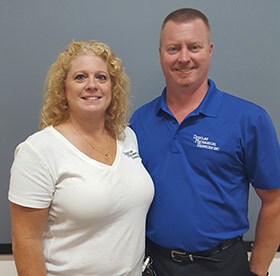 Douglas Mechanical Services of Connecticut was incorporated in May of 2004 and Doug Sturtevant, co-owner, has been in the field since 1986. We are your source for quality air conditioning, heating, refrigeration, venting, and installation. Conveniently located in Berlin, but servicing all of Central Connecticut, Douglas Mechanical Services takes pride in providing professional, high quality, and efficient service by knowledgeable licensed technicians. Doug obtained his technical training from Goodwin Tech in New Britain, through an apprenticeship program provided by the school (and the state of Connecticut). Through this program, Doug has obtained invaluable training and sense of workmanship that he has carried through the duration of his growing career. He has maintained a strong belief that the apprenticeship program is a valuable program that will continue to benefit the future incoming students. Doug started at United Mechanical formerly of Meriden. There, Doug trained under very knowledgeable technicians, and learned many aspects of his trade. He maintained employment at United Mechanical until spring of 2003, when his growing dream of having his own company was set into motion. Through the support and help of his wife, Jill, the company is now a thriving and well respected company. The goals of Douglas Mechanical are simple; good quality professional service to be provided by well trained technicians. Technicians that follow the rules and regulations that are set forth by Douglas Mechanical, along with Federal and State codes, to insure the utmost safety for all concerned. © 2019 Douglas Mechanical Services, Inc.